Many indoor cycling facilities add short demonstration classes every few weeks to encourage new riders to try indoor cycling, especially in the first few months of the year. Let’s talk about a unique variant of the demonstration class—the class designed to appeal to senior riders. Though these classes may only be 30 minutes long and don’t contain any complicated drills or advanced techniques, they can require more forethought than you might realize. What is different about teaching seniors in this kind of class? 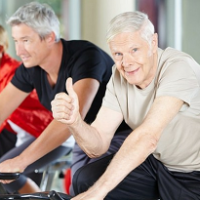 Having already started a successful twice-weekly Active Older Adults (AOA) cycling class at one of our local YMCA branches, I was recently asked to do it again at a different branch where no program existed. While my experience was specifically in dealing with seniors, many of the lessons I learned can also be applied to a more generalized beginner audience. I began marketing the new senior class to other instructors and personal trainers at the facility. Their recommendation to “go try Bill’s cycling class” made a difference. I also attended a non-cycling AOA class to invite members to come and give indoor cycling a try. My message: it’s not scary and we will have fun. Over about three weeks, new senior members began tentatively making their way to our cycling studio. The class was eventually converted to a regular time slot but the first several classes were taught as demonstration classes. As a result of the demonstration classes we have gone from an average of two riders to a regular attendance of 15 or more with the prospect of even further growth. Riders are having fun and seeing results! The most important rule of teaching a short demonstration class is to keep it very simple. The fact that it is a demonstration class does not mean you have to demonstrate everything you know. Other than keeping riders safe, you have only one goal in teaching a short class: make it fun. If you can get people to come back, you can add on more details then. Here are some of the points I think are most important to the proper teaching of a short demonstration class aimed at new older riders (or any new rider, for that matter). Thanks John. I teach a Tuesday and Thursday class at 12:00 and most of the class is in their 70’s. I would like to get more members to come at 12:00 and doing an introduction class before my 12:00 may be the way to enlarge my class. So do we not worry about their RPMs? Just let them go at whatever pace they can do? Encourage proper RPM, of course. Explain that as a very general rule, a flat road has an RPM of 80-100 and a hill 60-80. But don’t stress about it. The half hour will go so fast, there will hardly be time. My main point is that our job in a demo class is to get them to come back. Harping on rpm does not accomplish that. If they come back, there will be plenty of time to work on technique. This article is packed with great advice. Thanks, Bill, for sharing this information. Thanks Laura. I appreciate you saying so. Bill, I totally agree. This is excellent advice also for new riders who come to our class. Teaching the class on and off the bike allows you to interact and encourage their effort. Getting them set up and covering basic controls helps take the fear out the unknown. Spot on about letting them know if they can’t finish it’s OK. Great article. Thanks much, John. I appreciate your comments. Obviously you “get” this. Thanks.